10 | March | 2011 | WHAT A FEELING! Lucas is a precocious 14-year-old who has a few peculiar habits. He collects locusts. He carries a tape recorder that plays a sort of soundtrack to his life at key moments. And he goes to high school—because, “I’m accelerated,” as he says—with a bunch of older kids. Which means that Lucas is lonely, if bright. And Lucas is the story of a crucial turning point in the boy’s growth, when he finds out the meaning of life and love. That already sounds pretty wet, and Lucas steps into most of the gooey traps of such a story. Lucas (Corey Haim) meets a new girl (Kerri Green) in school; but she’s 18, and although she befriends the shrimp, she falls more seriously for the school football star (Charlie Sheen, Martin’s son). This is Lucas’s first heartbreak, and drives him back to his locusts (Lucas—locust—get it?). But Lucas contrives a way to prove his manhood on the football field, and conveniently finds another girl to replace his true love. This leads to a distastefully manipulative ending. In fact, the ending is so bogus, it makes you forget the fact that writer-director David Seltzer has pulled off a few sensitive scenes along the way. Seltzer gets a nice offbeat tone to a variety of encounters. When Sheen first notices Green, for instance, it’s at a school laundry, where they duet in an unusually long scene, both of them nervous, testing each other. And there’s a fresh angle to the scene in which Lucas brings his heart’s desire to an outdoor symphony concert—via the sewer. They travel underground until they’re near the performing shell, then they simply crack open a manhole cover not far from the music and enjoy the sounds wafting across the night. These little touches suggest that Seltzer has some desire to avoid the usual formula for these stories, and he’s got gobs of sincerity. That makes it all the more irritating when Seltzer slips into the nonsense of the final sequences, as Lucas insists he wants to play on the football team, in some desperate attempt to recapture the attention of his red-headed heartthrob. This, although he’d earlier announced that football players and cheerleaders were hopelessly superficial. He wasn’t quite right; it’s the film that gets increasingly superficial. Seltzer’s cast is agreeable enough; Haim is an engaging Lucas, Green is underwhelming but steady as the focus of Lucas’s attention, and Sheen, who looks more like his father than his brother, Emilio Estevez, has an interesting quality. Although he’s good, he never seems quite at ease; it’s as though something is eating at him. Rather than detract from his performance, this actually makes it more intriguing. I was going to drop the Charlie Sheen Week business but then coming across this review (entirely at random, I swear), I was struck by the final sentences. Because things still are very much eating at Charlie Sheen. 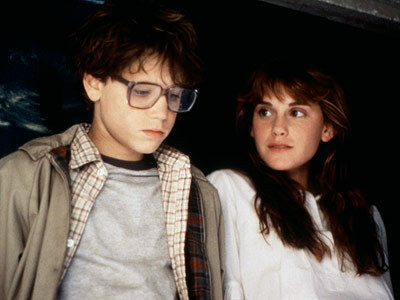 This movie brought on a memorable bout of high-rhapsody writing from Roger Ebert at the time, who compared it to The 400 Blows; but hey, the movie’s about a smart, bespectacled Chicago kid wrestling with first love, so let’s give the guy a pass. My review failed to mention another fresh young face in the cast, which belonged to Winona Ryder (let the whispers of the “curse of Lucas” proceed apace). Seltzer went on to make Punchline a couple of years later—and perhaps a man named Seltzer had to make a film about comedians—which wasn’t bad, but his follow-up was Shining Through, a train wreck. He created the Omen series, so he’s probably fine. You are currently browsing the WHAT A FEELING! blog archives for the day Thursday, March 10th, 2011.